SGIM provides you with the means to explore and clarify your career interests and meet and exceed your chosen aspirations! As a new member you will gain access to career development resources and an international network of primary care physicians largely based in academic and community health centers. Skills Development Opportunities: Attend the GIM Fellows Symposium at the Annual Meeting to enhance or build skills, network with other fellows, present scholarly work, and meet leaders from institutions across the U.S. Annual and Regional Meetings: Learn about the latest issues and innovations in general internal medicine. No matter the format or topic, SGIM meetings are peer driven and membership helps dictate each meeting; ensuring the interests and best practices of general internists. Mentoring Programs: Find a mentor. Offered in a variety of formats, mentoring at the national and regional level provides opportunity for students, residents, fellows, and faculty to access mentors during the annual meeting and have their questions answered on issues around career growth and practicing general internal medicine. Awards and Grants: Apply for national and regional recognition for exceptional achievements and innovations in the healthcare profession and/or for significant contributions to the mission of the Society. Committee and Task Force Participation: Build your CV while shaping the future of GIM! Interest Group Participation: Create or join an interest group on a specific or unique topic of interest. Networking opportunities extend from GIM Connect, SGIM’s online members-only community to the annual meeting, seven regional meetings, and participation in SGIM Committees, Task Forces, and Interest Groups. GIM Connect: Connect to SGIM’s online members-only community – featuring member directory and collaboration tools – all within a secure environment. Annual and Regional Meetings: Join over 2,000 general internists and trainees from leading academic centers and medical practices throughout the U.S., Canada, and other countries. Committee, Task Force, and Interest Group Participation: Get involved and make a difference in the field. SGIM maintains an extensive committee, task force, and interest group roster, allowing our members to join a variety of topical groups and utilize their experience and enthusiasm to engage their peers at every level of their professional career. Training Directories: Search Residency, Fellowship, and Public Health directories to learn more about programs throughout the U.S.
A core goal of SGIM is to foster professional interaction among leading academic researchers, general internists and trainees. No matter the format or topic, SGIM regional and national meetings are peer-driven by member-based communities to help ensure members’ interests are met and best practices shared. Submit and Present your Work: Present or review content to one of the eight meetings SGIM holds each year and have your work recognized by your peers and leaders in GIM through meeting presentation awards, offered at the national and regional level. CME and MOC: Access continuing education opportunities throughout your career. SGIM provides fully accredited training opportunities at an affordable price. In association with these trainings, SGIM members use a streamlined online process to receive the proper accreditation. As a member, you will have access to and receive copies of publications that act as vehicles for dialogue and interaction among SGIM members and the scientific community at large. Journal of General Internal Medicine: The official journal of the Society. JGIM has been ranked #1 in impact among primary care journals according to Google Scholar’s h5 index for three years in a row. Forum: Articles, essays, thought-pieces and editorials that reflect on health care trends, report on Society activities, and air important issues in general internal medicine and the health care system at large. 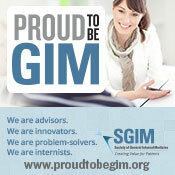 How Do I Join SGIM? New members may join online in minutes! Completing your membership application and profile online is is the most convenient and fastest way to start your SGIM membership. Learn more about these and additional award and grant opportunities here.